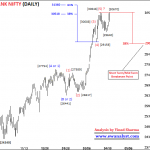 This is my first Elliott wave analysis of Bank Nifty with wave counts on all time frame charts. 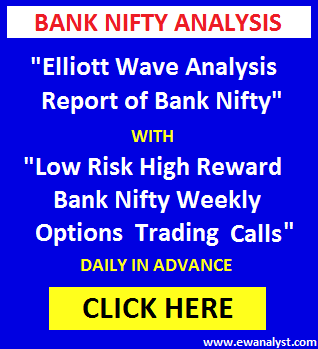 The whole journey of Bank Nifty is covered in this report with outlook for coming days, weeks and months. Bank Nifty index started in June 2005 but registered all time low later in March 2009. 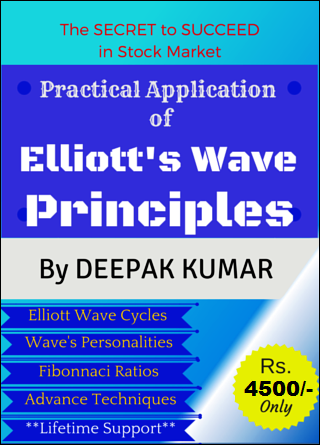 So main/major Elliott Wave cycle of Bank Nifty was started in 2009 from 3314 and I started wave counting from the same point. 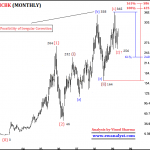 Have a look at wave counts on monthly chart. This is monthly chart of bank nifty covering move from all time low 3314 to high 21406. 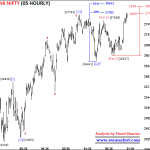 It may be wave (1) completed from 3314-13303, wave (2) completed from 13303-7766 and wave 3 is in progress. Inner wave (iv) of (3) may be completed at 13407 which retraced about 61% (deeper than normal 38%) and Wave (v) had achieved minimum 38% projection placed at 18426 and next 61% projection is placed at 21528 which may or may not be achieved. Wave (v) achieved its minimum projections but I am analyzing this wave (v) separately on daily chart to check if pattern is completed or not. 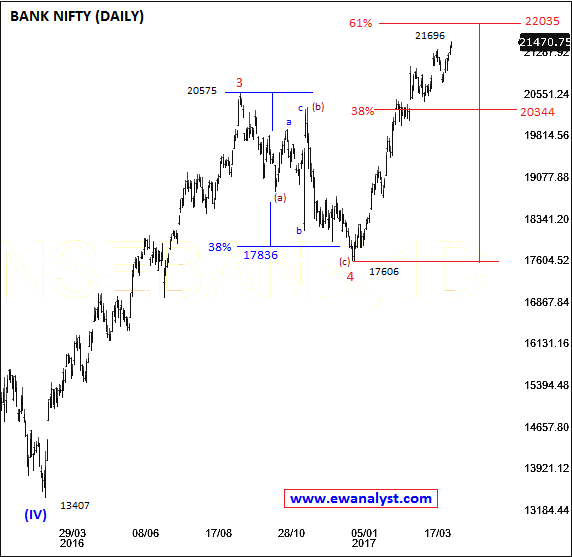 This is daily chart of bank nifty covering move from low 13407 which is marked as start of wave (v) on previous chart. 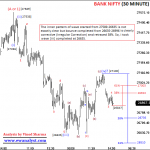 It may be inner wave 3 completed at 20575 and 4 completed at 17606 and wave 5 started from 17606. I marked wave 3 directly at 20575 because inner wave 1 and 2 are not identifiable and next retracement is almost 38% which can be wave 4. Wave 5 achieved minimum 38% projection placed at 20344 whereas 61% projection is placed at 22035. Wave 5 achieved its minimum projections but I am analyzing this wave 5 separately on 5 hourly chart to check if pattern is completed or not. 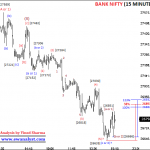 This is 5 hrs chart of Bank Nifty covering bounce from 17606 which is start of wave 5 on previous chart. Wave 5 can only be impulse or Ending Diagonal. Wave 5 is progressing as Impulse with inner wave (iv) completed at 20003 and (v) is in progress. Inner wave (v) achieved 38% projection placed at 21093 whereas 61% projection is placed at 21767 which may or may not be achieved. 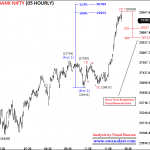 Bank Nifty high is 21696. Here again, Wave (v) achieved its minimum projections but I have to analyzing this wave (v) separately on hourly chart to check if pattern is completed or not. This is hourly chart of Bank Nifty showing bounce from 20003 which is start of wave (V) on previous chart. May be wave inner wave (3) of (v) is already completed at all time high 21696 and wave (4) may be in progress. Inner waves of wave (3) [from 20091-21696) are bit complex and inner wave V of (3) is highly extended more than 123% but counts are following all the rules. 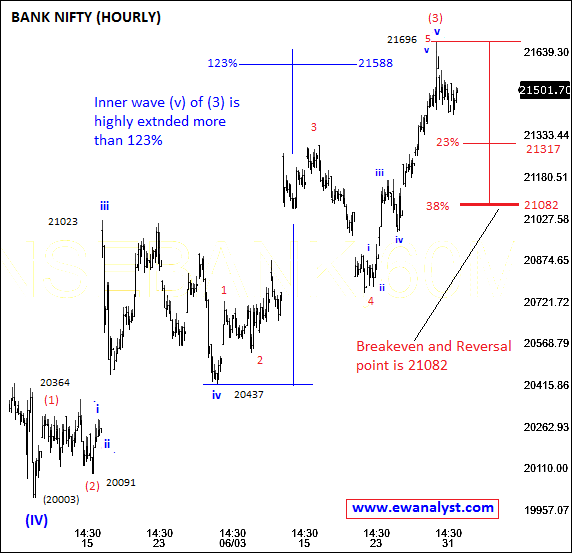 If wave (3) is completed at 21696 then we can expect some correction for wave (4). Normal 23%-38% retracement for wave (4) is 21317-21082. 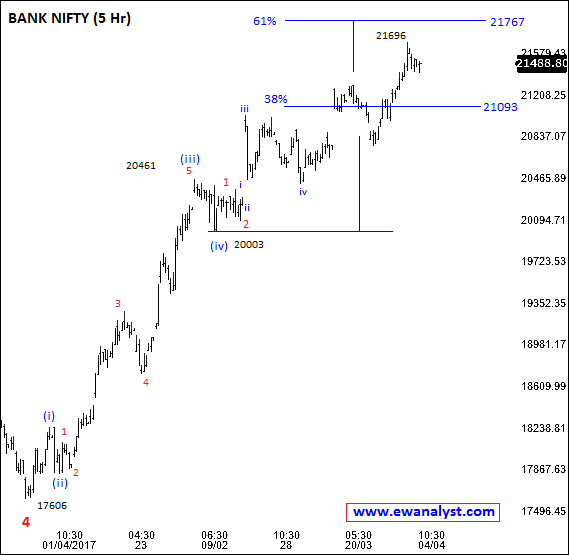 So, Bank Nifty have possibility to bounce again from 21317-21082 for new high above 21696 to complete wave (5) and 38% retracement 21082 is the breakeven/reversal point for short term because wave (4) rarely retrace more than 38%. Wave Counts on all the charts are indicating that wave (V) of bigger (3) is near to completion. 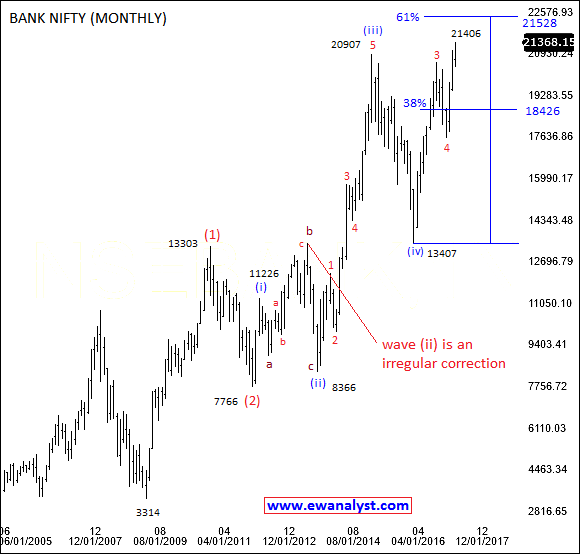 So, Bank Nifty can give a small or big correction/decline after completion of this wave (3). And for medium term, Bank Nifty has possibility to bounce again from approx. 21317-21082 range for new high above 21696 and reversal point for medium term is 21082. Breaking below 21082 can start deeper correction. This is just my first analysis report of Bank Nifty covering all time frames with general outlook. Short term outlook, expected targets, stoploss and trading strategies will be posted in my daily analysis on shortest time frame on this blog. Thanks for Sharing your view. All the best. Please keep on posting. 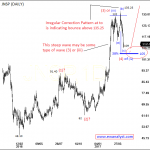 I m really like to see your coming post and stocks Elloit wave analysis. 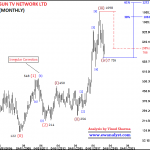 Hi, There is a mistake in the 1st chart above (monthly chart) above … waves (ii) and (iv) are overlapping … wave (ii) high is 13414 and wave (iv) low is 13407 … this overlap is not allowed as per EW rules.